Large-flowered trillium (Trillium grandiflorum), also known as wakerobin or large-flowered wakerobin, at peak bloom during late-May before the trees leaf-out. 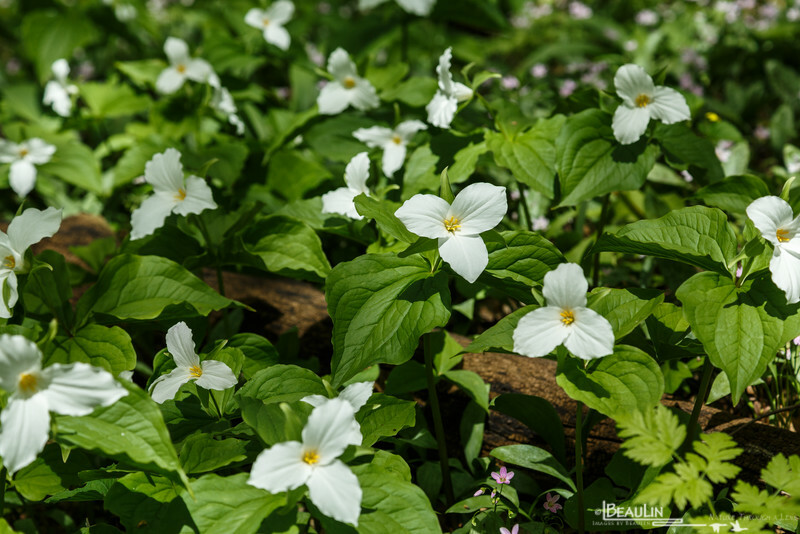 Trillium are among some of the earliest blooming woodland forbs in the understory of good quality mesic hardwood stands, and in rich soils can literally cover the forest floor like a carpet for up to a month. They are adversely affected by timber harvest or frequent surface fires. This and other spring ephemeral woodland forbs also do poorly where earthworms have been introduced into the area since they require a relatively thick, moist duff layer that worms remove. This and other spring woodland forbs with similar life-histories, recover very slowly from disturbances, owing to the extremely slow and short dispersal distances that require ants, among other insects, to distribute the seeds. Taken in a high quality mesic hardwood sugar maple-oak-basswood forest on a State Wildlife Management area in central Minnesota.